Santa left me some really really sweet gifts!! A set of Copic markers and glitter pens!! Woo-hoo!! I will have to tell you more later but I hope you have a really great Christmas Day!!! This is a card I made for my Mom to give with her finally Secret Santa gift. I had a lot of fun with this card! Can you tell? Lots of BLING!! Here is a close up of the tree and presents. 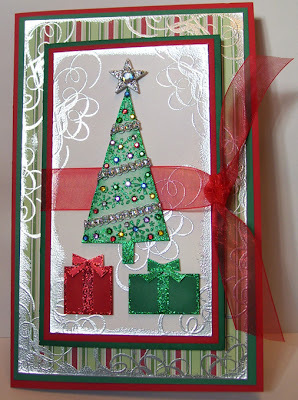 For the tree I used the Glorious Garlands stamp set and Green Galore CS with Glorious Green ink. 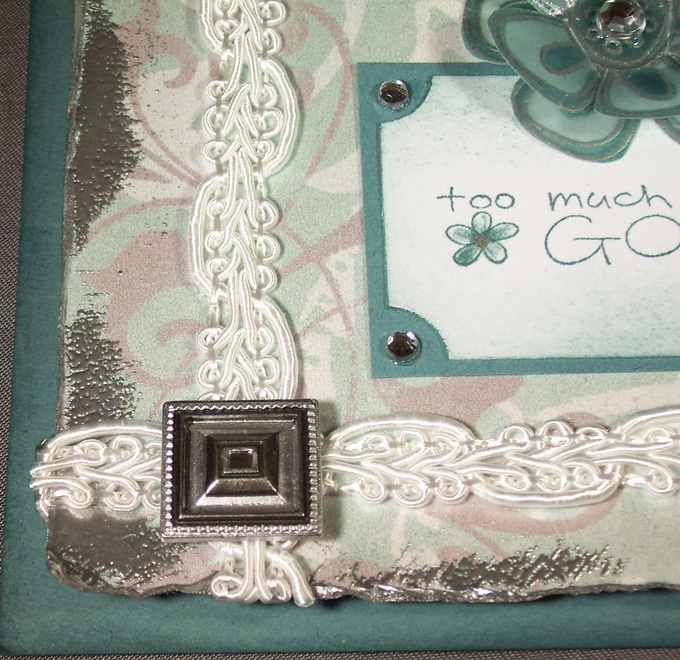 Then I sponged the edges, added the silver trim, rhinestones and stickles. For the star I used a piece of chipboard from the SU On Board Blossoms & Basics, painted it white, added stickles and a rhinestone. For the edges of the card I stamped using versa mark and then embossed with silver EP. Also to give the edges a frosted look I inked them with versa mark & embossed. 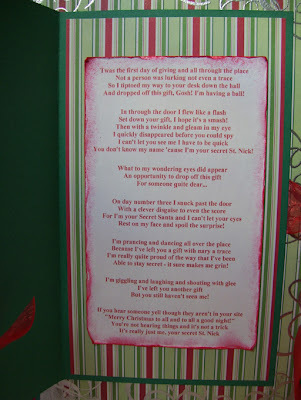 When the ribbon is untied the front of the card opens to reveal a Secret Santa poem. I don't know if I will get another chance to post before Christmas everything is so busy right now as I'm sure you all understand. *wink* We still have a little shopping to do, some goodies to make and tons of presents to wrap because you know Santa's elves are crazy like that with leaving the wrapping till the last few days!! LOL! I can't believe how fast the past few months have went by! I had so much fun doing the Christmas Club this year and I think all of the ladies had a good time as well. Here are the cards from our last get together. I was very happy with how this card turned out. The groovy guava, blush blossom and very vanilla all compliment each other. I added little touches of gold with the ribbon and gold twinkling H2O's. Other~SU-Ticket Corner Punch, Sponges, LuminArte-Gold Twinkling H2o's, My Stash-Gold Ribbon This card makes me think of frosted juniper berries. 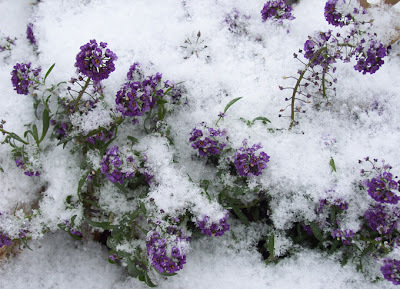 Before my youngest was born I was a manager at a local floral shop and one of my favorite things to do with the winter floral arrangements was to frost or glitter them. They always looks so pretty with all of the sparkles. 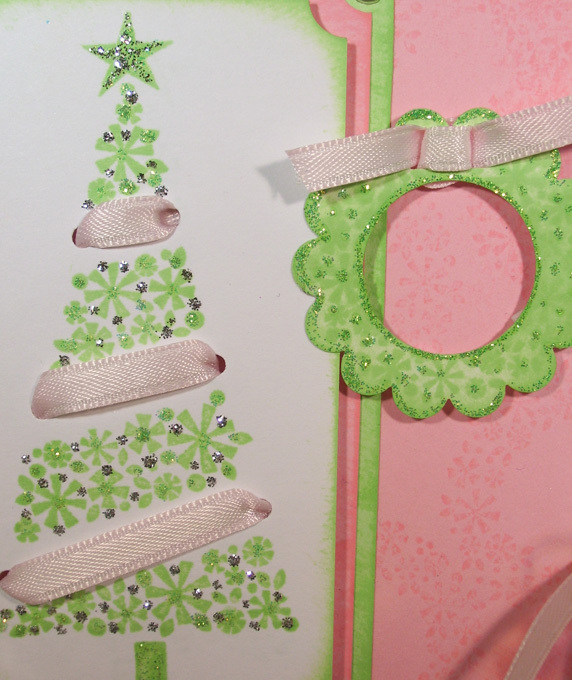 Other~SU-Watercolor Wonder Crayons, Aqua Painter, Distress Tool, 1/16 Circle Punch, 2-Way Glue Pen, Dazzling Diamond Glitter, Silver Brads, Sponges, My Stash-Silver Metallic Pen, Ribbon I know this is non-traditional Christmas colors but I love the pink & green combo with all of the sparkle & bling. Thanks so much for stopping by & looking!! I hope you have enjoyed the Christmas cards from club this year and maybe they have given you an idea or some inspiration. Good Luck with your Christmas cards--I'm still trying to finish up mine! Just a side note~Thank you so much for you kind words and well wishes for our little guy!! He is doing really good but still has to get a lot of rest. Hello!! Did you think I might have forgotten about all of you? I just wanted to do a real quick post to let you know I am still here & hope to be back within the next day or two. Our youngest just had surgery to remove his tonsils and adenoids and have tubes put in his years. The surgery went really good --he was such a trooper!! The doctor & nurses said he did such a great job!! Now we are just trying to keep as much fluid going as possible. Lots of popsicles & ice cream!! To all of my SB3 Sisters thank you so much for stopping by and all of the wonderful comments!! I hope to catch up with you all of you very soon!!! 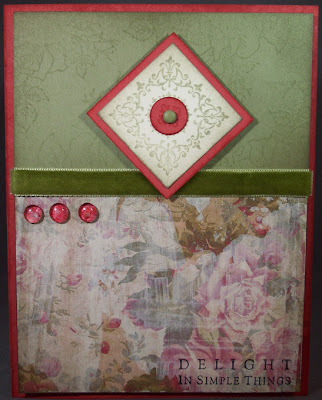 Here is a card I made this past weekend using a tent topper style. I really like the different shapes these cards can have and they still fit inside a standard envelope. For the topper part I used two scalloped ovals that I cut out using the Wizard and Spellbinders Nestabilities-Large Classic Scalloped Ovals. But if you don't own the Wizard or the Nestabilities you could also use large punches, templates, shape cutters or cut out different shapes using your paper cutter. On the smaller oval I stamped the flower image using black stazon ink, embossed the sentiment using versa mark and gold EP, then I used my watercolor crayons for the watercolor. You might notice some darker flecks in the watercolor, I wanted to give it a little more depth so I had my watercolor paper very wet while I was working on it, flipped it over and blotted on a clean piece of paper several times while working on it. Doing this will give it the fleck marks. 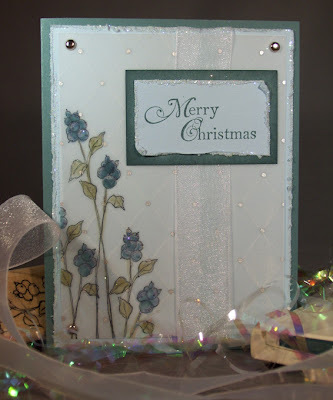 For the background piece I used a Cuttlebug Embossing Folder and ran it through the Wizard. 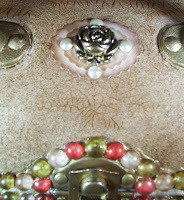 Then I lightly rubbed versa mark in over the entire piece and dusted it with perfect pearls. 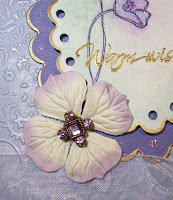 For an embellishment I added a prima flower, a jewelry finding for some bling and a touch of stickles for the glitter. Other~SU-Watercolor Crayons (Bright & Bold), Gold EP, Aqua Painter, 1/8 in Circle Punch, Spellbinders-Wizard Die Cutting and Embossing Machine, Large Classic Scalloped Oval Nestabilities, Ranger-Perfect Pearls, Stickles-Diamond, Cuttlebug-Embossing Folder, Prima, My Stash-Metallic Gold Pen, White Sheer Ribbon & Jewelry Finding. I think winter is here!! It has been so cold and snowing most of the day here. I had to cancel my stamping class tonight do to all of the blowing snow. :( Stay warm and if you are in some nice sunny or tropical place--lucky you--enjoy!! *wink* Thanks so much for stopping by today!! 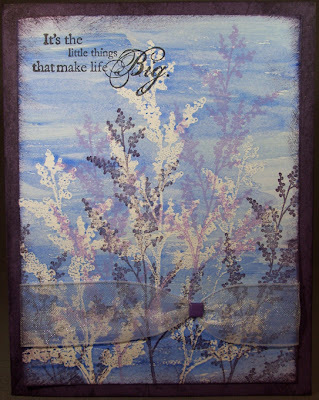 I joined a new group a couple of days ago called Sisterhood of the Blogging Stampers. I am in Group #3 and I am very excited to meet all of the sisters! I happened to come across the SBS link on Flossie’s Blog and I thought it sounded like a lot of fun. I think this will be a great way to meet some new friends, see some amazing design work, leave comments & encourage each other in our creative journey. Thank you to all of the sisters stopping by!! I can’t wait to check out all of your blogs, see your design work and get to know each of you!! 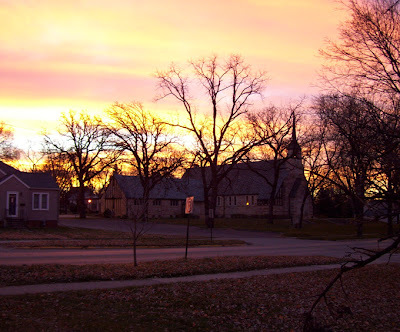 My name is Heidi and I live in Southern MN with my wonderful and very supportive DH (Eric) and our two boys (Dusty and Evan) and in the summer my step-son (Chase) comes to stay with us. I guess you would say we have a blended family-yours, mine & ours. Eric & I have been together for almost nine years & married almost six years. I have lived most of my life right here in MN and Eric is originally from WV, but lived in FL for almost ten years before moving here. 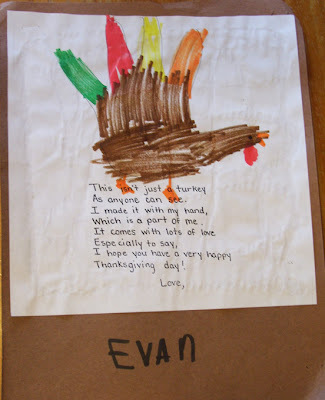 I have always loved crafts for as far back as I can remember. Over the years, I have been introduced to several different crafts. I am a floral designer, a painter, a stamper, and I have made jewelry. I started painting when I was 12, my Mom asked me if I would like to take a painting class with her. I loved it & have been painting ever since. I am now 36 and I started stamping when I was 17, back in 1988. Man that sounds like another lifetime ago! *gasp* My Mom gave me some stamps and ink pads for Christmas that year. To be honest I thought they were really neat but I wasn’t sure what exactly I was going to do with them. Back then we didn’t have any stamping stores around here. I can remember making some stationary & stamping on envelopes (mail art—who knew!). I still have some of those first pieces and they are kind of fun to look back on at times. There have been so many changes with stamping over the years and I love stamping now more than ever! Before my youngest son was born I was a manager at one of the local floral shops. It has been sometime since I have worked with fresh flowers (other than from the garden) but I still do some silk arrangements every now & then and I still dabble with jewelry making too. For the past few years I have been a SAHM and teaching stamping classes in my home. I have also taught classes at two LSS and for Community Ed. 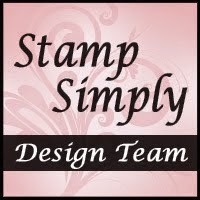 This January will be my two year anniversary as a Stampin’ Up! Demonstrator. Also in November I received one of the most exciting phone calls from Stacey Caron, President of Spellbinders Paper Arts. 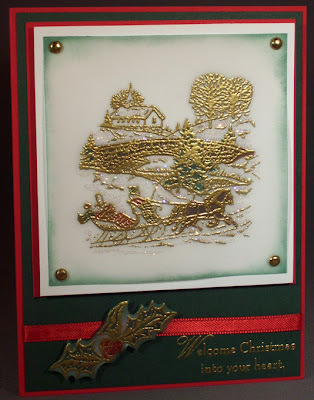 I was asked to join the Spellbinders 2008 Design Team!! I am so excited and honored to be given this opportunity!! I can’t wait until January when we will all get to meet in Phoenix, Arizona!! Thanks so much to all of the sisters who have already visited my blog and all of your Wonderful comments--WOW!! I hope to check your blogs out very soon & catch up with all of you!! Don't you just love getting a Surprise in the mail? I know I sure do!! Recently I received a wonderful gift in the mail, it was a new stamp set from SU!! Gotta love that!! 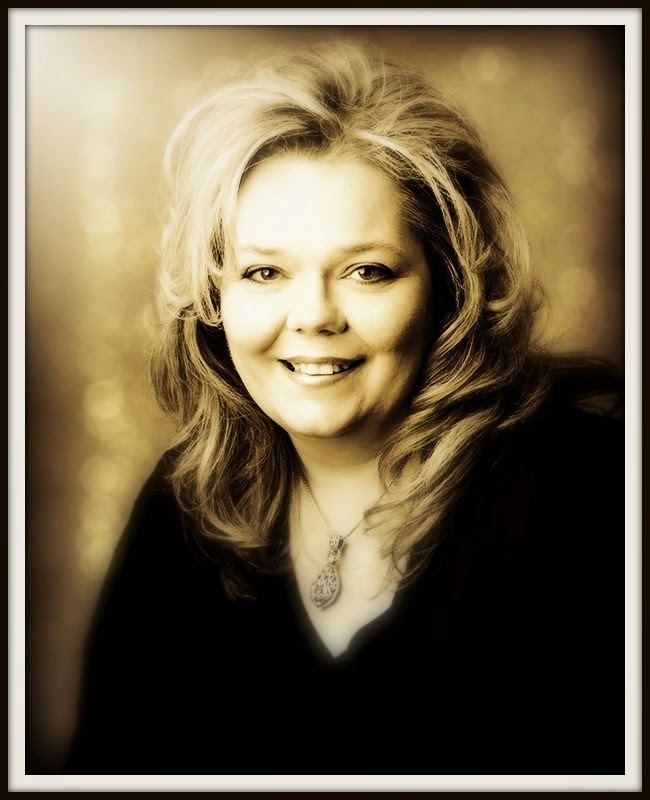 The stamp sets were a Appreciation gift from Shelli Gardner, Co-founder and CEO of SU. All of the SU demonstrators were given the Time Well Spent stamp set, it will be featured in the New Spring & Summer Catty as a Level 3 Hostess Set. Thank You Shelli & SU!! The NEW catty starts in January!! I can't wait to see all of the new stamp sets!! So did you all have a nice Thanksgiving & lots of yummy food? I hope it was a wonderful day for all! How many of you hit the stores for Black Friday? I didn't make it out at all on Friday, our little guy ended up getting sick Thursday evening so we spent most of the weekend at home. But Eric was up early and hit the stores for some good deals. He bought some presents for the boys and a new Christmas tree--a pre-lit one! The tree that we had was still in great shape but it took forever to get it put up and then add all the lights & decorations! This was so slick it was up and fluffed out in about an hour--gotta love that! The ornaments took a little longer but for the most part the tree is decorated but I am still trying to figure out what to do for the top. What does the top of your tree look like? Do you have a star, angel, ribbons or nothing at all? We have been looking for a really pretty star or angel for the last couple of years but just haven't had much luck. It seems like most of the trees that you see all done up in the stores just have ribbons or nothing at all on the top. I would love to hear what you do for your tree top! Once I figure out what we are doing I will take some pictures to share with you. 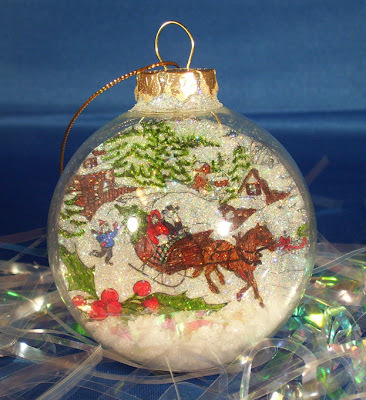 I have looked at a few different stores here in our town & I haven't been able to find the bigger clear ornaments. I have found a ton of the tiny ones & standard size so I have been thinking & thinking what could I do to alter this a little & still make it work?? If I use the standard size over 1/2 of it ended up in the little can and it just didn't look right. So I got an idea and went with it! What do you think? Instead of using a can I used a clear votive holder. 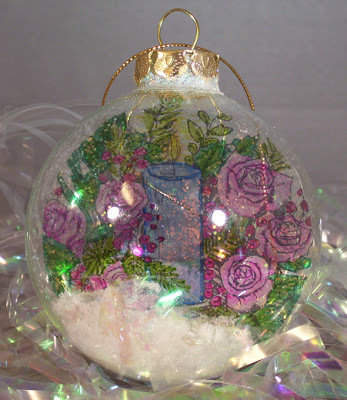 First I lined it with silver paper, filled it with snow and then used clear silicone to adhere the two pieces together (ornament & votive holder). 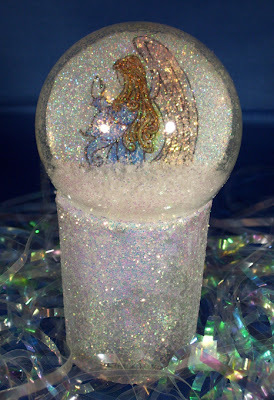 Once it was dry then I brushed crystal effects over the votive holder and sprinkled dazzling diamond glitter over it. Paper~3M-Transparencies Here's a little tip*If you aren't planning on heat embossing but would like to stamp with a permanent ink and do other techniques with transparencies buy the Write-on Transparency Film. It is a lot less expensive (about $10-$15 for a box of 100). Thanks so much for stopping by! I hope you are having a great week and enjoying the beginning of the Holiday Season! I hope you all have a wonderful day spent with your family & friends & lots & lots of yummy, yummy food!! I don't have any cards for today but I do have some really special artwork & a few pretty pictures. Hope you enjoy! 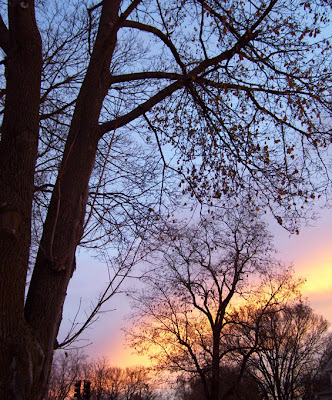 Sunrise~ Artwork~ This last Sunday we had a few snow flurries but it all melted as soon as it hit the ground. 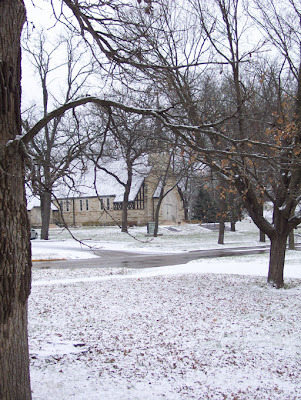 But last night it started snowing and this morning we woke up to a beautiful blanket of snow. Once again Happy Thanksgiving to all!!! I have been having soooo much fun making these!! 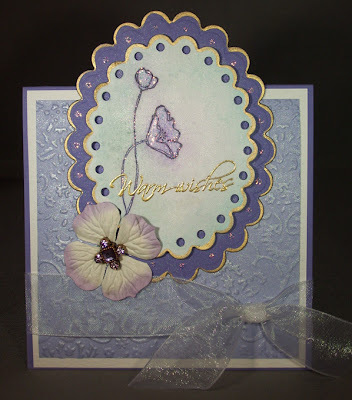 SCS has a wonderful tutorial by Vickie Maduzia click HERE to check it out! Thank you Vickie!! 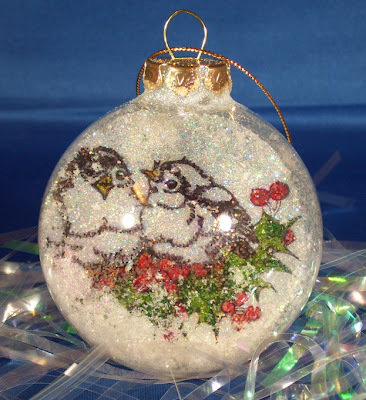 These Christmas ornaments are very easy & fast to make. They also make wonderful Christmas presents. Only a few supplies are needed to made these. 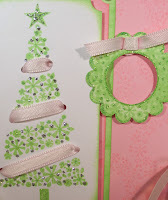 The main things are transparencies, clear ornaments & sharpie markers but for all of the details don't forget to check out the tutorial on SCS. These can be done simple or as fancy as you would like. Be creative! Here's a tip for you~If you would like to try shading when you are coloring in the image first go over the area with the lightest color. Come back in with the darker color going along the edges or where ever you would like the colors to be darker. Then come back in again with the lighter color and blend. When you do this you have to do a little and then scribble your marker on a piece of scratch paper to clean the tip and then go back and blend some more. HTH! Thank you for stopping by today and I hope that you are having a wonderful day!! As soon as I found out we needed to submit something with stamping I knew exactly what I wanted to do! Stampscapes!! If you haven't used Stampscapes or maybe if you haven't ever seen them before I strongly urge you to check out the website. They have some truly amazing design work on there and so many beautiful stamps to choose from! My husband, Eric is the one who introduced me to Stampscapes. I have to be honest I'm more into the girly & artsy stamps so several years ago when I was first introduced to them I didn't really know if they would be my kind of stamp. But with some encouragement (ok a lot!) from Eric I started working with them and I have grown to LOVE them!! After working with them I found out they are not as intimidating as they look! LOL! They are actually what I would call very user friendly. When working with Stampscapes your imagination is your only limitation!! You can use just one stamp or half a dozen to create some beautiful art! Over the years I have taught several classes using Stampscapes and people are always amazed at what they can create. *If you check out the the slide gallery you can see a Stampscapes card (with a wolf-the wolf isn't stampscapes) that I taught for one of my classes. 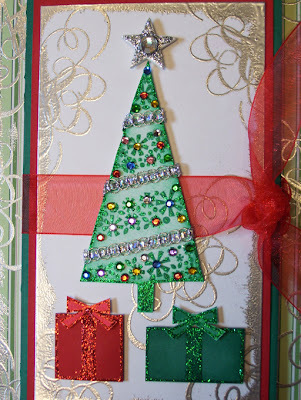 Awhile back I found a wonderful tutorial by Dawn Griffith on SCS for the Shadow Box Card. Click HERE for the link. I knew it would be perfect for this card! 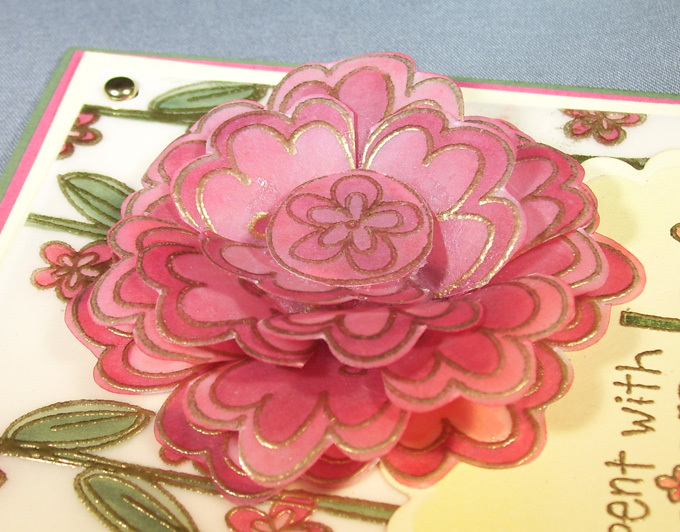 I used 9 stamps from Stampscapes to make this card. The die cuts were made using Spellbinders Wizard-Embossing & Die Cutting System. 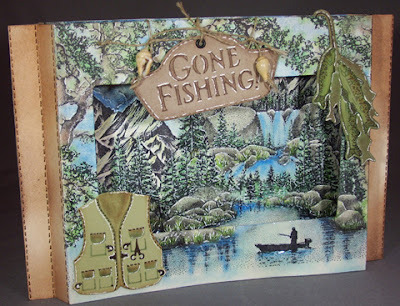 To add the fine details to the Gone Fishing sign, vest and the fish took five steps--1-Embossing, 2-Chalk, 3-Markers, 4-Inks (sponge & brush), 5-White Gel Pen. After I cut out each piece I left them in the die & used the die as a stencil for adding detail. Ok here is the last item--the altered item. I think I might be doing a few more of these! *wink* But before I can show you what I did I want to share the before picture with you. 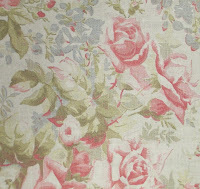 I have also included a picture of the designer paper before I distressed it. Before I could really get into altering the handbag I covered the entire piece with two coats of Gesso. 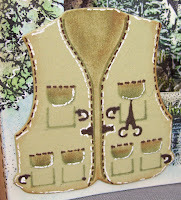 I used a white acrylic gesso which helped to adhere the paint, designer paper, die cuts and embellishments. So what do you think? I really, really want to use this!! But I am also afraid of something happening to it! 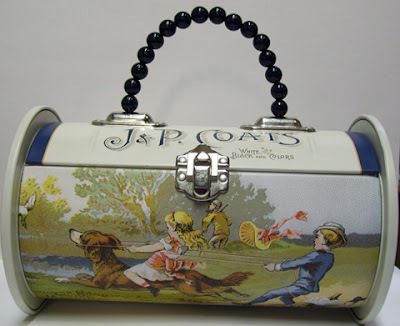 My Husband, Eric works for Hormel Foods and the Corporate/Management Christmas Dinner & Dance is just around the corner--maybe I will have to find an outfit to match the handbag! lol!! To alter/distress the the designer paper I started out by using an old gift card and some gesso. I swiped the card with gesso back and forth across the paper covering most of the paper. Let it dry. Then I took about a teaspoon of water and added several (30-40) drops of SU creamy caramel ink, took a sponge brush and quickly brushed across the entire piece of paper and let it dry. In the areas where there wasn't gesso it tinted the paper and gave it an aged look. 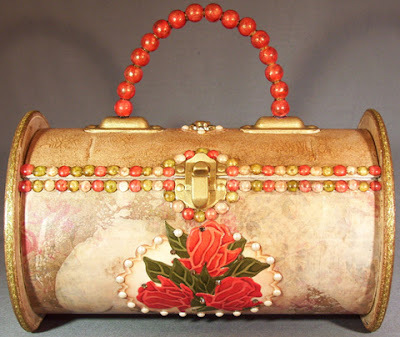 Also once the handbag was altered I brushed Perfect Pearls (Perfect Gold) by Ranger over the entire piece and then sealed it. Once again Thank You so much for stopping by & checking out my blog!! I always love reading your comments!! I hope you don't get too sick of hearing me say I can't wait until January!! This next year is going to be a wonderful journey full of new friendships and creativity!! I hope you are having a Terrific Week!! I think I am still floating in the clouds!! 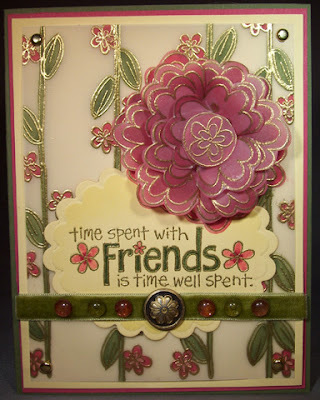 I am so excited about being on the Spellbinders 2008 Design Team!! I have to say WOW I am so very fortunate to be in the company of all these very talented ladies!! I can't wait until January when we will all get to meet in Phoenix, Arizona . 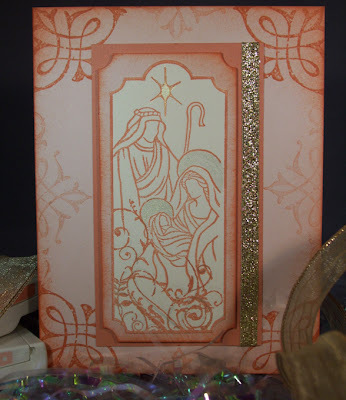 (S4 076) embossing & stenciling die and copper craft foil. I took these pictures of the boys a couple of years ago on a beautiful autumn day. I had so much fun designing this card!! 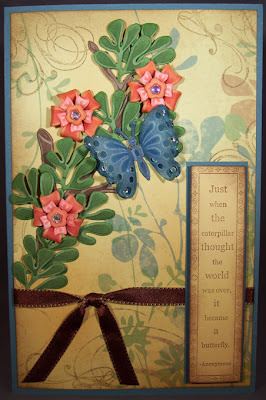 I knew I wanted to do something with the Butterfly Reflections (S3 038) embossing and stenciling die. I LOVE butterflies!! I thought about it for a couple of days, sketched it out and went to work. To add some dimension I rolled the petals of the flowers and some of the leaves. I also used silicone adhesive to attach all of the die cut pieces. (S4 076), Bugs (S4 008) Embossing & Stenciling Dies, Ranger-Stickles Diamond, Perfect Pearls, Swarovski Crystals-Crystal & AB, Horizon Fabrics-Brown/Gold Ribbon, My Stash-Silicone, Sponges & Pop Dots. I want to say "Thank You" for all of the wonderful comments you have left over the past few days!! 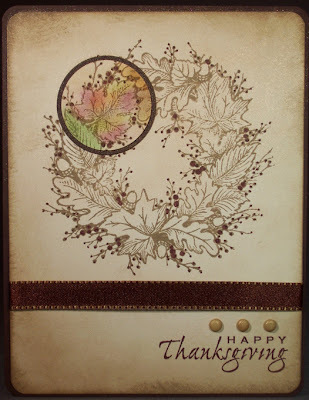 I hope you enjoyed part 1 of my DT submissions and don't forget to check back to see the altered and stamping projects. I hope you had a Marvelous Monday!! Woo-Hoo!! It's Official!!! 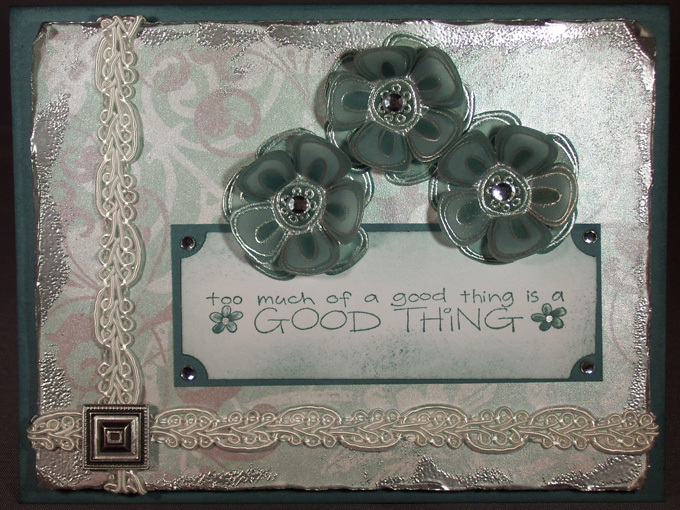 I am so thrilled to have been asked to join the Spellbinders 2008 Design Team!! I am so excited and honored to be given this opportunity! 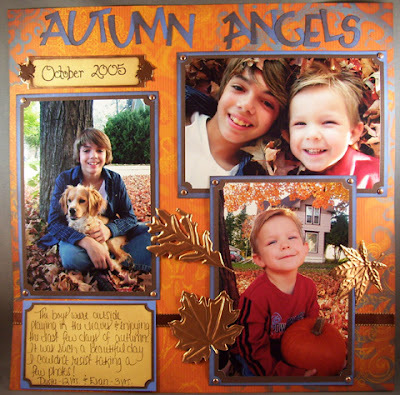 Spellbinders' website has all of the exciting news--check it out HERE! I can't believe we are already half way through November!! Where does the time go? I know it is really starting to feel like November outside, it is getting cold here in the North! 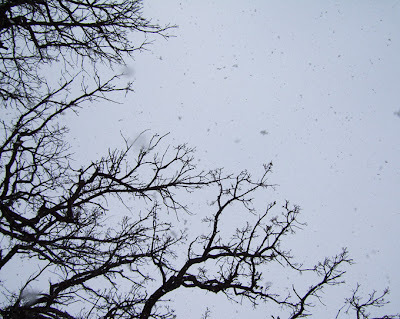 We even had a few flurries today. I think this one is one of my favorites! It didn't show up to well in the picture but IRL the card has a really soft gold shimmer. This was a really fun technique using Vaseline--who knew! I really like the color combo on this one. The third card~ I'm calling this one Aged Gesso. Does that sound like a good name for a technique? I was recently doing an altered item and I wanted the paper to have a more aged/vintage look and this is what I came up with. I will have to take a picture of the paper before I altered it and add it to the post when I add the rest of the details. Thanks so much for stopping by & I will try to get all of the info added asap! I hope you are having a Fantastic Week!!! This is one of my all time favorite stamps! I know it's not a newer one but I have used it on so many cards & for so many different occasions. The image of the Angel Baby just gives me a sense of peace and innocences. Sometimes with photography it can be so hard to capture the shimmering details. I keep playing around with the lighting trying to get the perfect picture and I think this one shows detail but also the softness of the colors. The Scalloped Oval is made using the Nestabilities Die Cuts from Spellbinders. I used watercolor paper for the embossed oval. 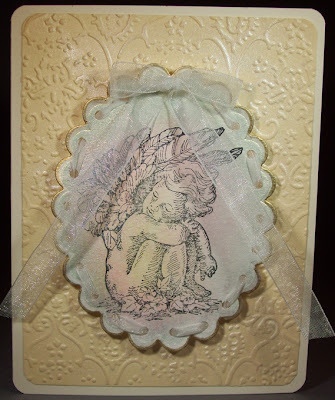 The angel image is stamped using black stazon ink. To achieve the soft coloring I started out by picking three pastel colors of ink, Barely Banana, Pretty In Pink & Bashful Blue. I lightly misted the watercolor paper with water, inked up a sponge with barely banana and blotted off most of the ink. *If you were painting something and used this technique it would be known as a dry brush. * Then starting in the center of the image I very lightly began to work in a small circular motion with the sponge. With each color I kept working the ink out to the edge of the oval. I also kept misting my paper which makes it easier to blend the inks. Once this was done I wanted to add a soft shimmer so I came in and highlighted different areas with twinkling H2O's. To finish off the oval I edged the scallops with a gold metallic pen, punched holes & wove the ribbon through. Also to add some shimmer to the background paper I lightly rubbed a versa mark ink pad over the embossed paper (Cuttlebug) and added some pearlex. I hope you are having a wonderful first half to your week & thanks so much for stopping by! Ok this has to be one of the simplest cards I have ever made but at the same time I am just tickled with it. I love the simplicity of it! I had this idea in my head for the last week an a half but I hadn't had the time to actually design it. I made the die cut images using the Wizard & Spellbinders Leaves Die. 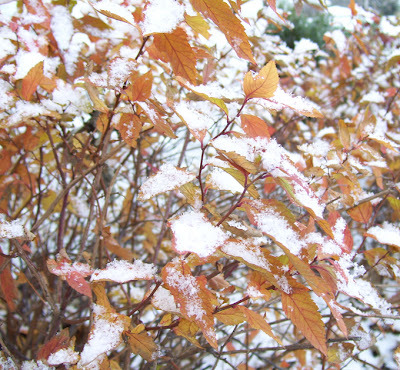 I thought the leaves looked kind of like a boxwood leaf that is used in a lot of Christmas floral arrangements. After I was done cutting & embossing the leaves I wanted to add some detail to them. For this you have to do one die cut at a time. I popped the leaf back into the die & used the die as a stencil. First I went over the leaf with chalk, starting from the bottom & working my way to the top of the leaves. Next I outlined the bottom of the leaves with a marker. Then I inked up a sponge & blotted some of the ink off, starting from the bottom of the leaves & swiped the sponge towards the top of the leaves. I know this might sound like a lot but it really goes a lot faster than it sounds. This card only took about 10 minutes. It also adds so much depth & detail to the die cut. Thanks so much for stopping by & I hope everyone is having a wonderful weekend!! This past Saturday I had a stamping class here at the house and we made several project using just one stamp set. The set we used is SU Sleigh Bells Ring which can be found in the Fall & Winter Catty. The stamp set was included in the cost of the class & all of the sets had been ordered a few weeks before so each of the ladies had their own stamp set to work with. They said they really liked doing a class this way. They had new ideas & already had the stamp set so they didn't have to wait for an order, they could go home and keep creating. For the class we made a card with a matching envy, a gift bag with matching tissue paper, a little chocolate treat bag & a glass Christmas ornament. 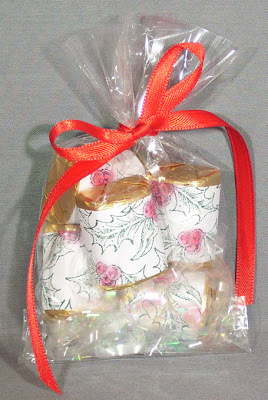 But I am going to be saving the Christmas ornament for a different post so today I will be sharing the card, gift bag & treat bag with you. 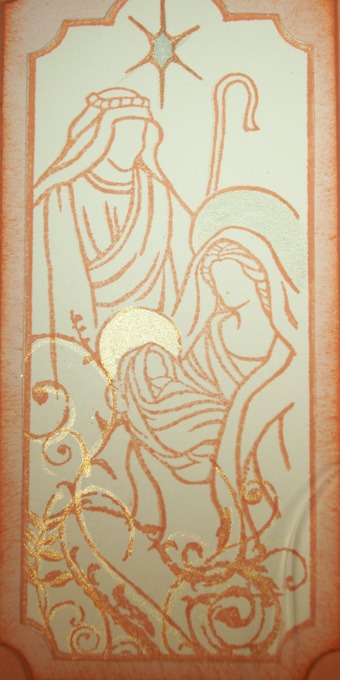 The images were stamped with versa mark ink unto vellum & then I used gold EP & added some color with markers on the backside of the vellum. I really like the look when you color on the backside of the vellum, it gives a much softer look. 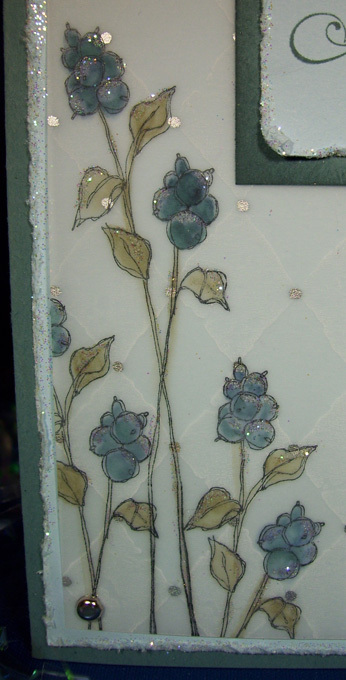 For a touch of sparkle to the front I added some dazzling diamond glitter with a 2-way glue pen. 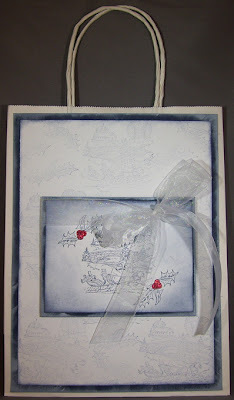 The Gift Bag~ For the background piece I used the images from the Sleigh Bells Ring set & Night of Navy ink. I stamped off twice to get the really faded look. Also on the Night of Navy CS I inked the edges (direct ink to paper) with SU White craft ink. Once you do this you need to set it aside to dry for a few minutes but it will give your paper a frosted look. The Chocolates are Hershey Nuggets with a stamped mailing label wrapped around them. Sorry the colors look a little off in this picture, I'm not sure why. On the mailing labels the red berries almost look pink but IRL they are red. To color in the berries I used a Q-tip and picked up ink from the ink pad. The tip of the Q-tip is just the right size for doing this. 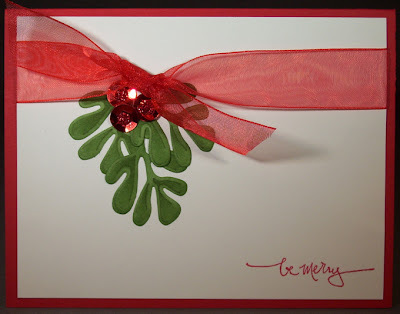 Thank you so much for stopping by & I hope you enjoyed looking at some of the Sleigh Bells Ring designs!